Nespresso delights Club Members and consumers in almost 60 countries thanks to its range of Grand Cru coffees, innovative machines and exclusive, personalised services. Pioneering the premium portioned coffee segment, Nespresso has become the reference in the segment and has shaped the global coffee culture. Coffee experts source the finest green coffee beans from around the world, pioneering new roasting, grinding and blending methods to create the ultimate coffee experience – only an estimated 1% to 2% of coffee grown globally meets Nespresso requirements in terms of taste, aroma and quality. With 16 aromatic profiles in its consumer range, theNespresso Grand Cru coffees are protected in aluminium capsules to guarantee optimum freshness and taste. A range of innovative, easy-to-use, stylish machines. Direct personalised relationships with consumers. Business-to-business solutions – including eight Grands Crus, specially designed machines and tailored services – to meet the needs of some of the most discerning establishments in the fine-dining and hospitality industry. With its Ecolaboration program, Nespresso works to integrate sustainability across its value chain, from farmers to consumers. Ecolaboration is about ensuring that sustainability is integral to everyday business decisions and working together with stakeholders to find new ways to create more value for society. 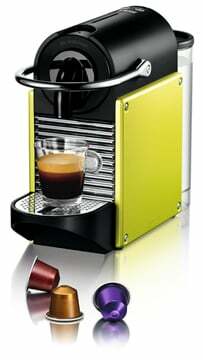 For more information visit the Nestlé Nespresso corporate website.